With Seven Seas' extensive experience even in the most challenging and austere environments, our customers can rest assured that we have the necessary infrastructure, systems and team to meet their needs. We are able to deliver a full scope of stores and consumables in line with industry standards such as IMPA and ISSA guides. Besides great service, we supply all kinds of cabin, deck and engine stores through our network of some 600 ports. We source high-quality products globally in bulk, allowing us to pass the cost savings to our customers. With our specialised bulk procurement, customers no longer have to work with multiple suppliers for different products and services. Consolidating all these orders under one supplier cuts down time and cost. We also offer reliable global framework agreement possibilities, simplifying your purchasing and logistics processes. Deck and engine stores including bridge stationary, publications, tools, ropes, wires, electrical supplies and valves. Strong commitment to quality efficient service. We strive to enhance customer satisfaction and improve our systems to ensure that we meet our customers' and applicable regulatory requirements as evident in our ISO 9001:2008 and ISO 14001:2004 global certification. We continually incorporate innovative solutions such as automated picking system in our facilities to increase our efficiency and speed of service. Another example is the warehouse management system at our logistic centre in Tarragona, Spain. It is fully integrated with Enterprise Resource Planning system. This allows us to achieve optimum operations across the entire supply chain. The tracking of inventory real-time is more precise, and picking errors are eliminated. This ensures that our customers get the right product when and where they need it. Access to other services and products. With our state-of-the-art warehousing facilities and competent delivery services, we are well prepared to handle all our customers' supplies, delivering them when and where they are needed along with cross-docking services for the products. 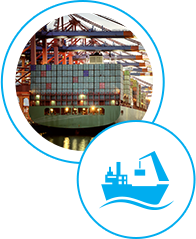 Customers can also benefit from our other services such as ship repair, cleaning and extended port services. We have also built up a core selection of high-quality provisions and bonded stores from selected suppliers and brands we know your crew prefers. For more information on the services we offer, or any of our products please contact us today.